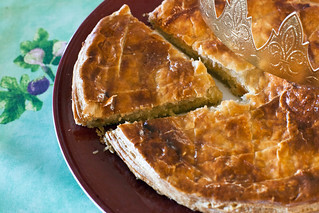 A traditional Gallette des rois, or French king cake. Love it. This cake is celebrating the Epiphany in France and sold in most bakeries in January. It is significantly different from the well-known King cake and consists of flaky puff pastry layers with a dense center of frangipane. Find more about it and the traditions that goes with it on the blog.